The MH-53M Pave Low IV is a modified MH-53J-model with the Interactive Defensive Avionics System/Multi-Mission Advanced Tactical Terminal or IDAS/MMAT. 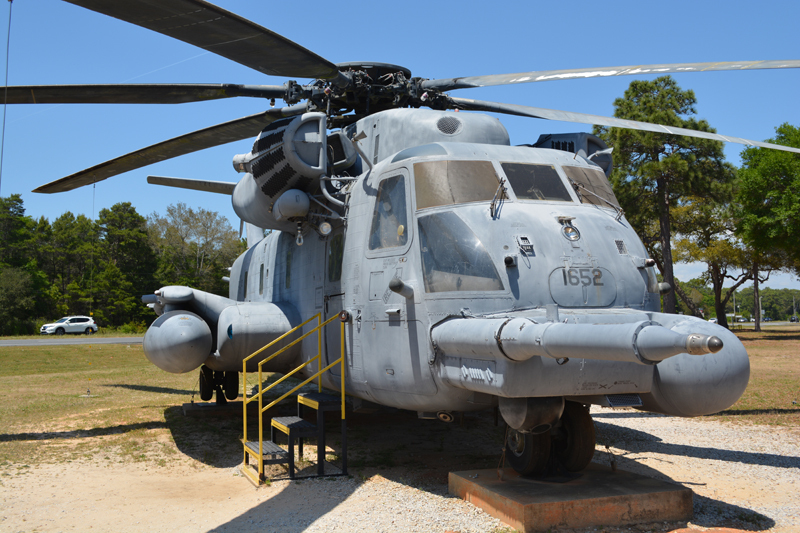 The system enhances present defensive capabilities of the Pave Low. It provides instant access to the total battlefield situation. It also provides a new level of detection avoidance so crews can avoid and defeat threats and replan enroute if needed. The Sikorsky HH-53 “Super Jolly Green Giant” is a USAF version of the CH-53 Sea Stallion helicopter for long-range combat search and rescue. The USAF received their first HH-53 in 1968. This series of helicopters were used in the Vietnam War, Apollo Space Program, numerous rescue and recovery missions, several Operations to include Desert Storm, Afghanistan and Iraqi Freedom. This MH-53M S/N 73-1652 was last assigned to the 16th Special Operations Wing (AFSOC) at Hurlburt Field, Fl. This helicopter was flown in to its final resting place on 5 Sept 2008. This helicopter was assigned to the 55th Air Rescue and Recovery Squadron (ARRS) at Eglin AFB from Jun 1976 – Jul 1980. During its stay at Eglin AFB; it was part of the Recovery Team that was sent to Jonestown, Guyana for the recovery of the 903 American bodies in the Jim Jones incident. This helicopter was flown for 34 years before being retired from service. The MH-53J/M fleet was retired in September 2008.